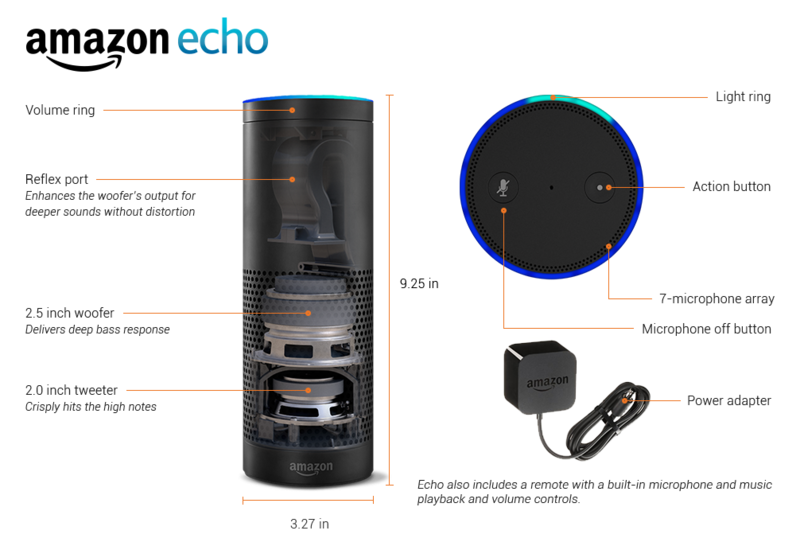 Amazon has a new product that doesn’t really have any current equivalent form any other tech company – a connected speaker called Echo that’s always-on, listening for commands that its virtual assistant can then respond to with information or by triggering a task. The cylindrical device has room-filling sound, and seven microphones on top, which use beam-forming tech to pinpoint your voice and ensure it can hear you no matter where you’re speaking to it in a room. It can filter out background noise, including playing music, in order to better understand requests, and it processes voice input via Amazon’s cloud-based web servers, meaning that it can get better at identifying requests and responding to commands over time. It has a 360-degree-firing speaker, and it works with both Bluetooth from your device, as well as built-in support for playback of music from Amazon Music Library, Prime Music, TuneIn and iHeartRadio. You can also get news and weather information from local radio, NPR, and ESPN via TuneIn, as well as other sources. It’ll answer queries and provide basic info from Wikipedia, give you word definitions, and even convert units on the fly. Amazon is shipping a dedicated Echo app to go with the speaker, which runs on Fire OS and Android, as well as a web-based app for iOS via Safari, and for control via desktop. You can use this to set up your service, to view and monitor alarms, check reminders and shopping lists you create and generally check info you input via the speaker itself. Amazon’s Echo is $199, or $99 for Prime members for a limited time, and requires an invite from the company to even be ordered. It’s pretty much out of left field, though we’d heard that Amazon’s highly secretive special projects Lab126 was working on various gadgets earlier this year. The concept of a whole-home Siri always on, and always ready for queries and to provide information, is also an idea that some had floated for inclusion in future versions of Apple TV hardware, and a notion at the heart of more than a few current startups. For Amazon, it has obvious benefits, since the whole concept involves the device listening for and processing voice queries from users. That aspect might also make users uneasy with the idea overall, in a similar way to how many found that Amazon’s Fire Phone appeared to be more about funnelling shoppers to Amazon’s web store than providing user-oriented convenience. Amazon notes that it only listens when you say the activation word, which appears to be “Alexa” by default. The whole thing is a tad baffling, but also intriguing in that it’s fairly unique among major tech company product introductions. Plus, if this thing gets wider connectivity to the growing category of smart home devices, like Philips Hue connected bulbs or Nest’s learning thermostat, you could see it shifting to become a whole-home smart hub. As it currently stands, though, this seems like an odd pitch to make to consumers, although perhaps more sensible than a smartphone with a 3D display you have to move your head around to navigate.